I pretty much always wear my hair up--and this gorgeous gold hair band gives me one more reason to keep doing it. Love. That is beautiful! I love the hair chain clip, also. Very grecian goddess! I am amazed by your blog - Great concept and amazing choices! I'm totally into your idea of mixing expensive with cheap and I believe that is the real definition of personal style. May I just suggest that you remove the comment moderation? it's not a very easy process and it can sometimes prevent people from giving you feedback. I am going to stalk this. 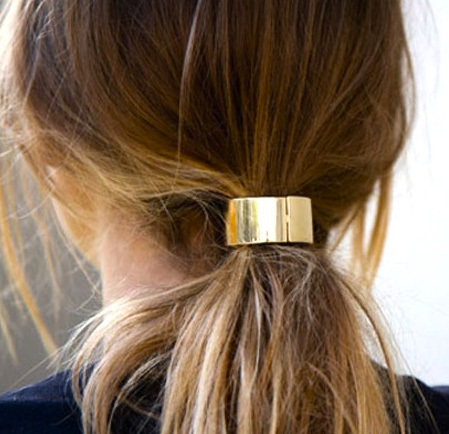 What a simple, chic addition to a ponytail.